I wish to share information about Rev Fr. Roberto de Nobili who spent many years to propagate Christianity among the Tamils. Roberto de Nobili was an Italian Jesuit born in Montepulciano, Tuscany, in September,1577. He was the first son of a nobleman, a general in the papal army. After his father's demise at the age of seventeen Roberto chose to join the Society of Jesus founded by Ignatious Loyola, in spite of opposition from his family,which had contributed numerous clerics to the Church , including several Cardinals and at two Popes.Thus in 1596, ignoring his family's wishes, he entered the Jesuit novitiate with the intention of becoming a foreign missionary. After a brilliant course of studies he sailed for the Indian mission in October, 1604, arriving at Goa on 20 May, 1605. After a short stay at Cochin and among the fishermen in coramandal Coast, he moved in November, 1606, to Madurai, great cultural center of Tamils ruled by Telugu Nayaks, patrons of Vedic learning and Hinduism. Here he spent close to next fifty years in the service of his Lord.The policy of Portuguese clergy until then was to try and achieve to increase the number of converts, by conversion of the downtrodden lower classes to Christianity, sometimes forcefully, hardly making contacts with the upper castes. They set strict rules after conversions, getting the new recruits to eat meat, change their entire ways of life etc which earned them no good will, the converts were still considered lower class. The revised priority in India, therefore for the Jesuits, was to free Hindus from the stranglehold of the Brahmins as set by St Xavier. The resident Jesuit priest in Madurai was making not much headway with conversions and not a single Brahmin could be converted thus far. Instead the Portuguese and their Priests earned the sobriquet of Pirangis or Firangis, unclean white-men, bracketed with lower class people. Soon, Fr.Roberto de Nobili understood the iron bound Caste system that held the Hindu society strongly. As a result, he decided to move ahead and accept the restrictions of caste and refuse to condemn any social custom or idea in this regard. First, he tried to ally the fear that he was a Portuguese (Pirangi) Priest, but a holy man from Italy like a Brahmin in India.. He moved from the missionary compound into a house in the Brahmin quarter of the city and shaved his head and sported a tuft of hair. He spoke only Tamil, hired a Brahmin cook and houseboy, and became a vegetarian. Like many Brahmins, Roberto de Nobili limited himself to one meal a day. He abandoned the black cassock and leather wear of the Jesuits for a saffron robe and wooden clogs. He put sandalwood paste on his forehead to like a Brahmin priest and even wore sacred thread across his shoulder for some time, as a sign of his caste rank.. He referred to himself as an ascetic or a sannyasi. Eventually, he preferred the company of Brahmins and even ate only with them. He bathed daily and cleansed himself ceremonially before saying mass. Thus it looked, instead of converting Brahmins, he converted himself as a Brahmin ! With the help of his scholarly Brahmin associate in the School run by Catholics, he learnt Sanskrit, Tamil and Telugu. In two years he mastered these languages to the extend of conversing fluently in Tamil and Telugu, and studying Sacred Texts of Vedas and Upanishads. Perhaps de Nobili was the " first European to study those venerable classics". 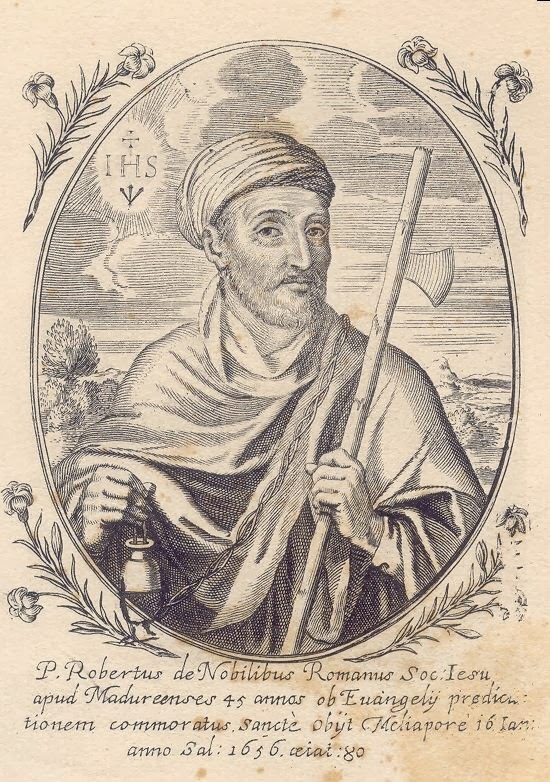 In 1613 de Nobili wrote a detailed treatise on Hindu customs, and importance of careful adaptation of missionary methods, "Preaching Wisdom to the Wise- Three Treatises by Roberto de Nobili" which his Portuguese Jesuit superiors disagreed. However in 1623 Pope Gregory XV issued a papal document, that largely approved de Nobili's approach. Through the next forty-five years he wrote over twenty volumes of Catholic teachings in Sanskrit and Tamil. Roberto de Nobili was a polyglot well versed in fourteen languages. "He composed Catechisms, apologetic works and philosophic discourses in Tamil, and contributed greatly to the development of modern Tamil prose writing". "As he expounded the Christian doctrine in Tamil he coined several words to communicate his message. He used the word "Kovil" (கோவில்) for a place of worship, "arul" (அருள்) and "prasadam" "(பிரசாதம்) for grace, "guru" (குரு) for priest or teacher, "Vedam" (வேதம்) for the Bible, "poosai" (பூசை) for Mass, etc". Regarding number of Brahmin converts by de Nobili, there are different numbers given in books. But it was not significant. The reason as one author said, by getting converted, Brahmins viewed that they gain nothing. They enjoy status in society, looked after well by the rulers and the rich. Then why should they convert themselves to a new religion. During his final years Roberto de Nobili courted many controversies and banished to Jaffna, where he had lost much of his eye sight. Eventually the Church refused to allow him back to his favorite Madurai, instead sent to San Thome, Mylapore, Madras, where after spending eight years as a broken, penniless and blind man Rev.Fr.Roberto de Nobili, the Count of Civitella died in the year 1656. His tomb is not identified till now.